Over the last several years, the North Carolina Coastal Federation central staff members have worked with approximately a dozen Boy Scouts on their Eagle Scout projects. In most cases, individual Boy Scouts reach out to the federation to learn about projects they can work on or do. Rachel Bisesi, coastal education coordinator at the central office, said they are a big help to the federation. 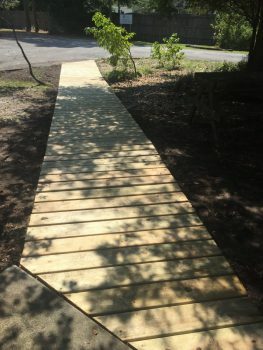 Most recently, one Boy Scout, Trent Lupton, built a boardwalk across the grass between the federation’s central and headquarters offices. This walkway helps staff cross more easily between the offices. Lupton reached out to the federation after two of his friends had completed projects there. Bisesi suggested the boardwalk and doing some maintenance on the federation’s rain garden. “I liked the proposition of constructing something because it seemed very meaningful and something that I can hopefully go back and visit many years from now,” Lupton said. Lupton said the teamwork was his favorite part about working on that project, but that at first he was a little nervous about leading a group. Lupton has now received all of the required merit badges for his Eagle Scout. He will soon complete the paperwork and hopes to go before the Eagle Board before Christmas. He is a member of Troop 130 in Morehead City. Another Boy Scout, Lupton’s friend Christian Quinn, recently installed bluebird nest boxes at North River Wetlands Preserve in Otway and at EarthWise Farm in Ocean. These boxes provide habitat and encourage these native birds to make their homes at the wetlands preserve. Boy Scout projects generally help improve the federation’s environmental education and habitat work. Boy Scouts have installed wood duck boxes at North River Wetlands Preserve and have done trailblazing work at the Patsy Pond Nature Trail across from the federation office. One also built an information kiosk at the Patsy Pond trail to inform visitors about the habitat and wildlife in the area. Others have worked on building raised garden beds at EarthWise Farm. Bisesi said other members of the Boy Scout’s troop will often help with the construction of his project. 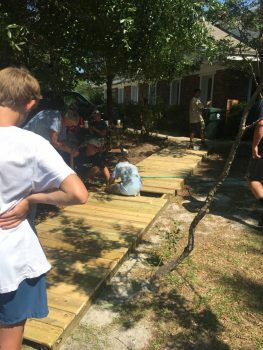 The Boy Scout working on the Eagle Scout project is responsible for getting materials, which are often obtained through fundraising or donations from local hardware stores.